Shop Smart offer: Free Tea Towel for orders over £20. Check in shop for current promotions and details. Caterham Linens provides many kinds of bed linen such as duvet covers, bedspreads and sheets in a variety of fabrics such as poly-cotton, pure Egyptian cotton and brushed cotton, in a wide range of colours. To further compliment your bedroom needs, we stock a wide range of ready-made curtains, net curtains and made-to-measure voiles and even jardinières. Many people with allergies or asthma have problems with naturally-filled duvets and pillows. Caterham Linens provide many suitable hypo-allergenic alternatives. 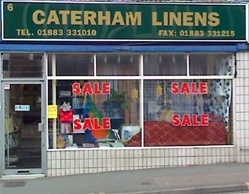 Frequently likened to Aladdin’s cave, craftwork lovers visit Caterham Linens often. This is because we supply all kinds of haberdashery, thread and double-knit wool as well as ribbon. Also available are a wide range of towels from face flannels to bath sheets in a variety of colours, qualities and sizes. 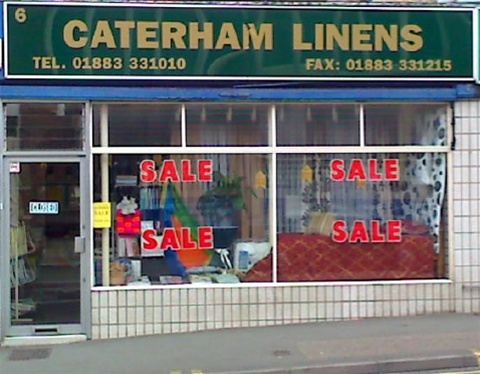 For excellent and friendly service and competitive prices, we look forward to seeing you at Caterham Linens. Opening Hours: Monday – Saturday 9am to 5.30pm. Closed on Sunday and Bank Holiday.